Excitebots is everything a great sequel should be - and then some! When Excite Truck launched alongside the Nintendo Wii console it was the perfect showpiece for showing off the Wii console's motion controls while still providing a true arcade racing experience for gamers to sink their teeth into. 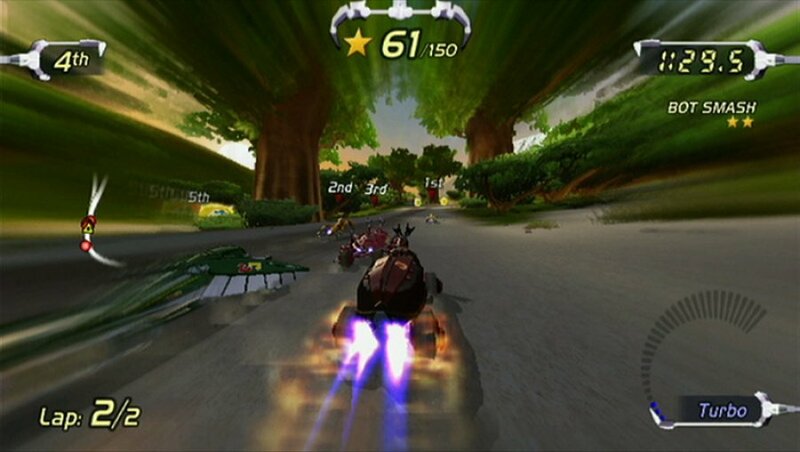 While the game lacked the real-life physics and game play of some of the current generation's more realistic racing titles, it introduced an over-the-top intensity that couldn't be matched when it came to slamming on the accelerator and going full tilt through the game's various tracks. Now with the release of the sequel, Nintendo once again unleashes the insane racing action but this time around they add a bit more variety to the overall package, not to mention some of the absolute coolest robotic vehicles ever seen in a racing game. 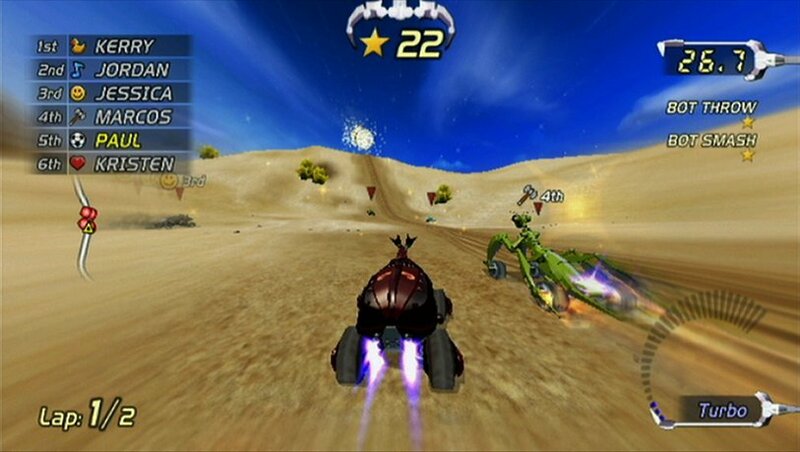 There are several racing modes to choose from in Excitebots. 'Excite Race' is the heart of the package and can be played either as a single-player experience or you can team up with another local opponent in the split-screen versus game. The game is broken down into five Cups, each one featuring five tracks to race through. When you begin the game, only the first Cup is available so you'll have to earn a B grade or better on each track to unlock the next one. You earn high grades by finishing races in first place and by performing lots of fancy aerial acrobatics that will earn you star points. The more star points you earn in each race, the better the overall grade will be at the end. You'll also be able to use these star points to purchase better racing bots, which can make earning the higher grades much easier in the later races. 'Poker Race' is the other game mode in Excitebots and provides an interesting twist on the Excite Race mode. In Poker Race you must gather up playing cards that are strung across various sections of the track. Your ultimate goal is to form poker hands that you can score to earn star points. You can even choose which cards to replace as you drive along. This adds a whole new strategy to the standard race and forces you to decide ahead of time what cards you want to pick up. The better the poker hand, the more star points you'll earn and the better grade you'll receive for the track. While Poker Race is a nice change of pace from the standard races, it does tend to take away some of the all-out intensity of the main game mode. Next up is the online Wi-Fi mode. This is where you can join a group of up to five other racers from around the world to compete in either the Excite Race or Poker Racer modes. 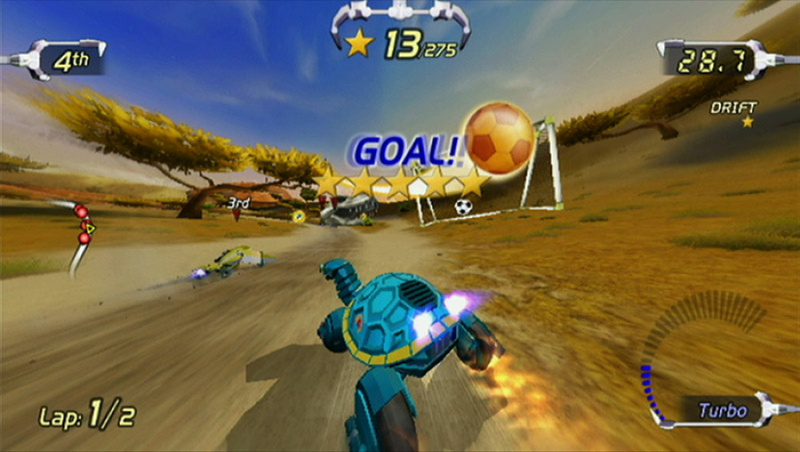 Both modes still feature the same rules and goals, only this time you can feel the true multi-player racing action the game features. 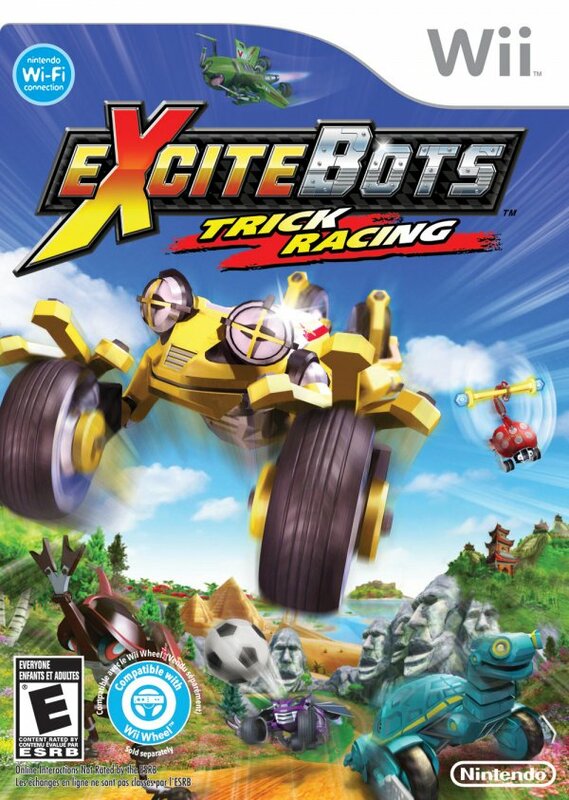 If ever there were a game that truly puts the Nintendo Wii's Wi-Fi capabilities to good use it's Excitebots. The time spent waiting to join a game is minimal and you'll still be able to choose which bot you want to use as well as what track you'd like to race in. The game then randomly picks the track chosen by one of the six players in your group and the race commences. The racing action is just as intense as ever and you'll get the chance to compete against some of the best Excitebot racers the world has to offer. You can even send one of your replays or a racing challenge to one of your friends. While there are mini-games strung throughout all of the races in the game, you can also choose to play them individually. They range from Darts, where you'll have to launch a giant dart from your Excitebot at a giant bulls-eye target, to Bowling where you merely ram your vehicle into a set up bowling pins. There are 10 mini-games to choose from and they all represent an excellent way to pratice for when you face these challenges during the actual races. You can even compete against a local opponent in each of the mini-games as well. The quality of each event varies but they break up the pace of the game nicely. 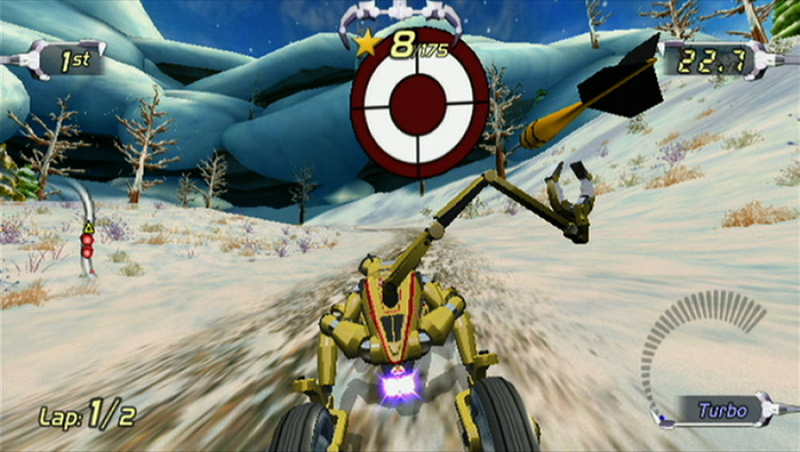 The motion controls in Excitebots are extremely similar to those found in the original Excite Truck release. You can choose to use either the Wii Remote by itself, or pop your Wii Remote into the wheel attachment for a more realistic racing experience. You still have one button for acceleration and one button for braking and reverse. You also have the "B" button, which will give your bots a serious turbo boost. While this boost will come in quite handy when you need to make up some ground on your racing opponents, you'll have to use it sparingly or you'll end up overheating your bot; this will result in a brief period of restricted speed while the boost recharges. Aerial stunts also play a huge role in the game, ranging from mid-air spins to high-flying backflips. These stunts are where you can earn some big star points if you're skillful enough. You'll also be able to grab Question Mark Triggers along the way that can earn you special attack powers that can be used against the other racers. There's nothing quite like pulling the giant hammer out and smashing the opposing racers as flat as a pancake. You'll sometiems even trigger one of the various mini-games to add even more star point earning potential to the mix. It's this unique combination of out-of-control racing physics blended with the smooth Wii motion controls that make the game such an absolute blast to play, alone or with friends. Visually speaking, Excitebots is also very impressive. 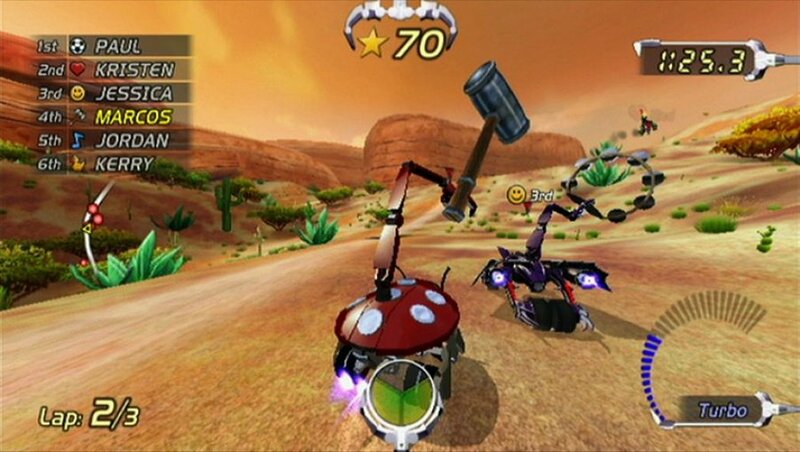 Each of the tracks features loads of detail and some of the most vibrant colors seen in a Wii title. But for all the lush surroundings, nothing stands out quite like the blur effect that you'll see whenever your vehicle starts moving at a really high rate of speed. You'll catch yourself pressing the turbo boost button just to see the backgrounds streak by with the fancy motion blur in full effect. Couple these impressive visual feats with the fact that every track has its own distinct look and style and you have what is one of the more impressive Wii graphics experiences the system has to offer, especially considering how blisteringly fast things tend to move by onscreen. Not to be outdone by the eye-popping visuals of the game, the audio package manages to hit a high note also. There's plenty of catchy tunes to help carry the flat-out intensity of the game's racing action, and there are even a few tunes that directly fit in with the current race track location. You'll know you're in Egypt long before you see a pyramid just by listening to the musical track playing in the background. The sound effects are also quite good. You'll get your fill of engine revving and turbo boosts, not to mention that all-too-pleasing sound of your hammer smashing an opponent's bot into oblivion. And if you are fortunate enough to own a good Dolby sound system, prepare to rattle the walls with Excitebots. It's clear that Nintendo put every bit as much thought and effort into the audio package as they did the visuals and it pays off big in the finished product. If you're looking for a realistic racing experience then I'm sorry to report that you've come to the wrong place. Excitebots isn't about an authentic racing experience, it's about flooring the accelerator and holding on for dear life. As good as the original Excite Truck release was, Excitebots brings so much more to the table with its unique robotic insect and animal-themed vehicles and all-new gameplay additions. Excitebots takes all of the patented over-the-top racing action of the original Excite Truck and steps it up about 10 notches. The end result is one of the most enjoyable Nintendo Wii titles to date and a game that's almost impossible to put down once you begin playing it. It may not feature the depth of Gran Turismo or Forza, but its a damn sight more entertaining. A fantastic review, as always Corbie. Excitebots was the most fun I've had on the Wii in a long time. Can you still put up your own music from SD card, like in Excite Truck? Corbie is this crossed between mario kart and battallion wars and is it easy to find a game via Nintendo WFC ? I don't believe you can use your own music this time around. I've never played Battalion Wars and yes it was very easy to get into a game on the Wi-Fi. Much easier than I expected. This is the kind of game that will remind you why you love playing video games in the first place. I'll be playing this one some more this weekend, I can tell you that. I want that Dracula Bat! Corbie, I didn't really like Excite Truck much, the controls felt too unrealistic and unresponsive, do you think I'd like this one? The controls are just as unrealistic, but I didn't find any problem with the control response. This is just a lot more interesting in terms of theme and execution. Let me put it this way - I liked Excite Truck, I love Excitebots! I really like this game. I just got ExciteTruck a couple of weeks ago, and loved it, so I didn't make the same mistake this time. I bought ExciteBots the day it came out, and I am glad I did. As far as the SD card music goes for ExciteTruck, I can't get it to work. The music will play from my SD card on the Photo Channel, but I can't even select the SD card option in ExciteTruck. Does anyone know what I need to do? How decent is the slew of unlockables? (New tracks, karts, etc.?) Does that help to keep playing or is the replay all in the gameplay? A little of both. The unlockables will keep you coming back, but it's the gameplay that's just so addictive. It might be a good game but there are lots of things that bug me about it. Sweet, looking forward to the UK release of this one. Does the single player have the ultra annoying rubberbanding of Mario Kart Wii? It was my first Mario Kart game and it really made the game unenjoyable for me. I am really surprised. I assumed this game would be a generic cash-in of Excite Truck, but its getting good reviews on many sites. Anyway the more arcade style racers the better. sweet. this is just what I wanted to hear. first disc purchase I have to do for a while. I loved Truck, though, and never understood the naysayers anyway. The controls were very smooth, responsive and accurate it's the game physics that are unrealistic and thats the point of the game; it's supposed to be crazy and over the top; it's not a stock car game by any stretch. All fun, no "stats" based racing on a flat track. Sounds like this is that and then some, I can't wait to go get it. a couple possibilites; if you've done your regular firmware updates you'll see that the Wii doesn't support MP3's anymore and you may be playing music with the now compatible AAC on the Photo Channel. If so, it won't play in Trucks. Truck uses it's own software to play MP3s from the card (if it likes the card) so even with the most recent firmware, you should be able to play MP3's in Truck (NOT AAC's). This means you need a card with only MP3's on it for playing Trucks. Remember Trucks was released when Wii played MP3's and probably only supported regular SD cards (maybe not SDHC), so you need to do it that way. It doesn't seem to like some cheaper made cards sometimes either, but most do work, also it may not like it if there are other file types at all on there, I think it needs to see only MP3's on there to work. I just use an old smaller card of favorite MP3 songs ONLY for Trucks music and it will recognize it and show up on the menu highlitable again. The old 1 & 2 GB cards are so cheap now it's worth keeping one just for your trucks mix. If it's working you'll be able to pause during a race and see the SD hard option there to manage. If not it's just not there as an option. It's way worth it to do it if you like the game. @LinktotheFuture - Are you using the new photo channel which plays AACs? These files are incompatible with Excite Truck which only plays MP3s. If that's not the issue, then there are two things I can think of: 1) SDHC cards (>2GB) do not appear to be supported by Excite Truck. 2) The program creating the MP3 container isn't doing it quite right and the files need to be re-encoded. (I had this issue with some AACs on the DSi.) The info in this thread might help. @Corbie - Excellent review as usual. I expected this game to be good. I'm happy to head that Nintendo and Monster didn't disappoint! I haven't played Excitetruck in ages, but I've been dying for another good Wii racer, so I'll be giving this one a shot. I knew it was awesome, seeing vids of it on youtube made me wanting this game. All I want is a releasedate. Thanks for everyone's help with my SD card music problem. I will have to try everything you all have told me. yup great review, I couldnt agree more. I am addicted to this game. It is a lot of fun. I would take it over Mario Kart Wii any day. Do you prefer the wheel attachment or just the controller itself? Oh I much prefer using the wheel attachment. Hey can you play online with a guest player in split screens???? Wow, really amazing score! I guess I gotta go and pick this up now! The best thing is that if you already have the wheel attachment then the game is only $39.99!!! Spencer got busy so I took the review. I'm a nice guy that way. This is some of the most fun I've ever had playing a videogame. Insane amounts of fun. I actually think I like it better than Mario Kart Wii, because it doesn't have that "random frustration" factor. Oh man!, this got to be a lot better than I thought, I hope I will be able to buy it some day. So is this better than Mario Kart Wii? This game is now on my to get list. I was one of those people who let out a great big sigh when this was announced.... Now I cant wait for it to be released. And they've sorted out the terrible audio...thank goodness. Excite Truck has some of the worst videogame music I've ever heard. I need this game, so much!! If it's a long wait I will cry! EU release next friday please, waaaagh! Does anyone know how to make mp3 files from a CD so I can put them on an SD card and play them while playing ExciteTruck? And great review Corbie - the game is incredible. We rented it for 5 days, and it was a blast online and off. Only complaint is the offline multiplayer is two bots only. I'll be buying it this summer, pocketbook permitting. Good revw.This was already on my insta-buy list . The anticipation for the its release is killin' me even more now! That's way better than Mario Kart wii for one simple reason. Sense of speed. Looks fun but how much is it? "Looks fun but how much is it?" $50 with the wheel, $40 without. Gutted this will probably never come to UK. Gutted. They better[/] release this in europe soon! Dude This game is awsomer than Mario kart and i own both. It is not a multiplayer game type. But it is a super addicting game that has omega replayibility! February 2011....and still no sign of this ever coming out here. I loved Excite Truck, I definitely would've bought this. Shame on you Nintendo UK. just bought this today. very excited. got a great deal too. 26 bucks for the wheel and game, brand new. have to wait couple weeks for it to arrive though. wherever the guy selling the game is from must be very far away from me. said to expect it anywhere from the 21st to the 9th next month. I actually bought a US Wii in late 2009 just to play this game as I loved Excite Truck so much, and it was becoming clear that this game would not release outside the US. The game was amazing one of the best and most refreshing games I had played in a long time, however I had to sell my US Wii not long after as I needed the cash, but now I see the game has found a release in Japan recently, there may be hope for a European and Australian release! If that DID happen I would defo be buying it again, no doubts. Come on NOE, pleeeeeeaaaaaaaaaassssssssssseeeeeeee???? ?